More than 1000 of you have signed up already to come to our Big Birthday Weekend at the end of February. Tickets for Saturday are now sold out, but there are still about 80 left for the Sunday event. We’ve had lots of excited email from people who are coming, who want to know more about what we’ll be getting up to. Mike Horne (who many of you know as Recantha) and Tim Richardson, who run the Cambridge Jams and who are doing the lion’s share of the organising for this event, have been kind enough to provide an update for everybody. We’d like to say a HUGE thank you to Mike, Tim and Lisa Mather, who are all members of our wonderful community who have volunteered to do the massive bulk of the organisational work on this event for us for free – we’re a very small team and we simply couldn’t have managed this without them all. Thanks guys! Hello everyone. Mike Horne and Tim Richardson here to update you on the Raspberry Pi Big Birthday Weekend. It has been quite a couple of weeks. On the 13th of January, we visited the University of Cambridge Computer Laboratory in the hope that it would act as the venue for the Raspberry Pi Big Birthday Weekend. We were incredibly impressed with the place and we would like to thank Professor Jon Crowcroft for making us feel so welcome and showing us around. It is a brilliant venue and we are very lucky to be able to hold it there. Since that visit, it would be fair to say that we haven’t stopped! We opened up booking on the 14th January and since then we have sold over 1000 tickets across the two days and the party. The party sold out first, closely followed by the Saturday day event. There are still tickets available for the Sunday, and we are now running a waiting list for the Saturday. If you’d like to join us on the Sunday or join the waiting list, please register. What will be happening at the Big Birthday Weekend? We will have two lecture theatres and two workshop rooms. about their penguin and rhino monitoring stations; and a healthy education element (we’ve had loads of offers of education talks). There will be LOTS more – we’re just trying to sort through everything now! Panels will include: a group of youngsters talking about how the Raspberry Pi has changed their lives; advice on running crowdfunding campaigns; a Foundation Education Team panel; a technical panel including Raspberry Pi engineers; and Q&As with all the people you know from the Foundation from social media and this blog. Workshops will include: an introduction to integrating the Pi with electronics; a session for beginner Pi users which will help them get set up; basic Minecraft programming skills; advanced Minecraft hacking with GPIO interfacing; a Scratch hackathon. On the Saturday evening there is, of course, a birthday party. We have had to limit this to 275 people, due to catering arrangements. There will be food, Raspberry Pi-themed drink, cake and much, much more. Logistics for the party are being spearheaded by Lisa Mather and Tim. Lisa has been an absolute star for agreeing to help with the party, especially as she’s way up in Manchester. From there, she has been organising goodie bags and decorations and generally being brilliant, coming up with ideas to make the Lab look welcoming and exciting, as well as lending her party planning experience to help us not to miss anything! Tim and Lisa are also working out what Pi-powered party games we will be having, as well as organising Pi-powered music for the occasion. Tim has also been organising the Marketplace for the event. The Marketplace will feature many well-known names in the Pi community including The Pi Hut, PiBorg, 4Tronix, Pimoroni and also a newcomer to the Pi arena: IQaudio who specialise in GPIO audio boards. We are hoping that there will be another couple of vendors joining us, but they need to confirm with us. We’re inviting anyone who has their own Raspberry Pi-based robot to bring it along to show it off. 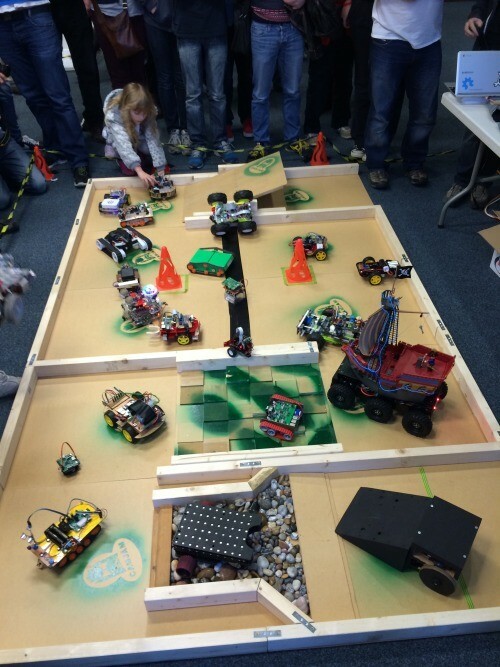 At Pi Wars we had a highly popular obstacle course. This course will be making an appearance at the Birthday Weekend (after Tim has carefully put it all back together again!) and you are invited to bring your own robot to try it out! One of the other things we have been working on with the Foundation team is an information page for the event. On this page you will find information on the venue, parking and where to stay in Cambridge if you require accommodation. We hope you’ll find the information there useful. If you have any questions about the event, please mail [email protected] and we’ll attempt to answer them as best we can and then add that information, if appropriate, to the information page. That’s it for now – we are aiming to keep you up-to-date with what has been happening every week, so don’t forget to keep on checking back! I’m really looking forward to this! I vote that there are badges for people to write their Twitter handles on, it’s always great to be able to put a face to a tweet! We’re going to provide sticky labels for people when they come in – hopefully people won’t mind writing their own! Of course, if people want to wear a t-shirt with their name/Twitter handle on it too, that’s even better! This is going to be the first CamJam I have been too! Really looking forward to meeting everybody! Looking forward to it. Is this the same building that the very first CamJam was held in? Sounds awesome. I wish I could be there, but it is a long way to come from Australia :(. Unfortunately can’t make this CamJam, will it be streamed from the new location? Good to see that you now have a larger venue, the previous one was nice but you had outgrown it. Probably won’t be streamed, but we’re hoping to record it.